JOHNSON VALLEY, CA: Hammerking Productions is pleased to announce the 2019 dates have been secured for the King of The Hammers! The 13th annual KOH week will commence with Hammertown opening to the public on Friday, February 1st, 2019 and will continue through Saturday, February 9th, 2019. The actual King of The Hammers race will take place on Friday, February 8th, 2019. Most races from 2018 will return for 2019 including: The Every Man Challenge, KOH UTV Race, and the Shootout. New for 2019 is the Toyo Tires Desert Invitational Presented by Monster Energy: this will be a T1 Desert Truck race held on Thursday, February 7th, 2019. About King of The Hammers: King of the Hammers is considered the toughest one-day off road race in the world. It is the largest off-road race event in North America in terms of both competitors and spectators. It combines desert racing and rock crawling, and has expanded from one race to a series of 5 races held throughout the week that take place each February in Johnson Valley, CA. Official 2019 Hammer Town Addresses are HERE! The Latest Information for KOH is available HERE! All drivers must login to register and pay for race related items! Do this before continuing with registration. Login is located in the upper right hand corner. If you've raced with us in the past, you already have a driver profile. Please do not make a new profile as your race history is associated with your existing account. You must login with your username (or email address) and password. If you don't remember your password, simply click on "request new password" with the username or email address you used. Select the "season commitment" button if you wish to receive a discounted entry fee at KOH for committing to race at least 3 regional races next season. For those signing up for KOH Week, you have two options: you can select either the single race price (more expensive), or the series committed price (less expensive). Drivers that commit to racing at LEAST 3 races in either the Eastern or Western Regional Series receive a significant discount on their KOH Week entry fee as well as their series entry fees. You DO NOT need to pay for the whole series until after KOH. Series committed drivers must pay for the season by April 1st. PLEASE NOTE: Drivers that select series price and do not race 3 races will be charged the KOH price difference plus a handling fee. Two options: Run a total of 40 hours or run 24/7 for Race Week, you pick what's best for you! More info and orders available HERE! Dedicated WiFi Will Be Available at KOH! Get Your Service Reserved Today! Limited-speed public Wifi will also be available in town, but if you have a team to run, vendor space to manage or just want steady internet access no matter how many people are on the Lakebed, dedicated Wifi is the way to go! Want the inside scoop and missed the 4 Wheel Parts 2019 KOH Pre-Show at Amada? Check it out HERE! Reserve your Yellowbrick GPS Tracker: Yellowbrick tracking is required for all classes and races except shootout. Rental Price for all classes is $165. You do not need special mounting hardware for this device. Drivers racing multiple races must rent one tracker per registered race. This Hammertown Map contains all garage locations and highlights premium spots. When paying for your spot. Please indicate if you prefer same spot as last year. If it is more important to be by another driver, please type their name into the text box provided. 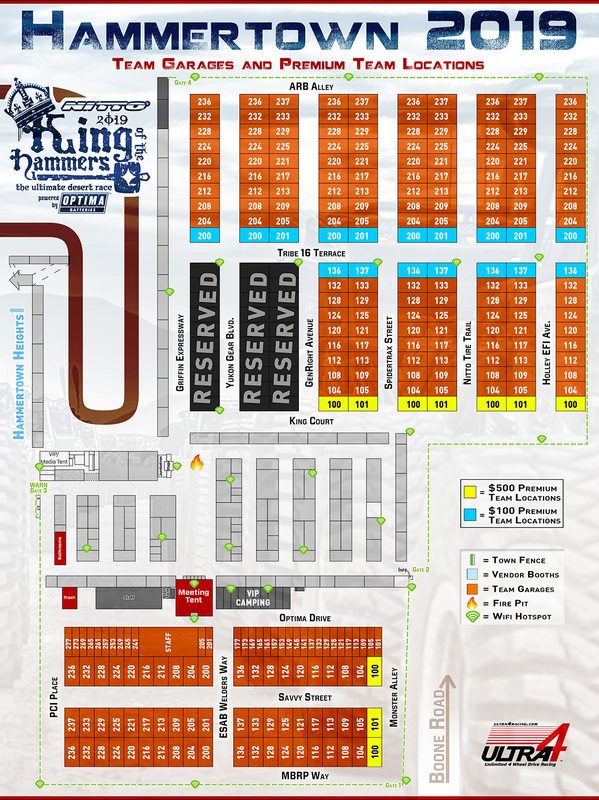 Hammertown garage locations are available for all registered teams. Only those drivers that have registered for a KOH Week race and purchased a 40'x80' hammertown spot for $50 will be eligible for a spot in Hammertown. One 40' x 80' spot is available for each registered driver. Drivers are eligible for one spot per entry. The payment does not guarantee a specific location but it does guarantee a spot within Hammertown. We will assign garage locations starting with returning teams followed by new teams that have paid the reservation fee. The order will be based on the order in which driver of record registered. Premium Garage Locations. We are continuing to offer drivers who wish to have end cap locations a chance to do so for a premium. End Caps will first be offered to the teams that reserved them last year. End caps closest to Hammertown and Boone Rd will be $500 and end caps between streets will be $100. If you plan to purchase an annual USAC license you do NOT need to pay for tech inspection as it is included in your Annual license. If you only plan to purchase a single race license for KOH Week only from USAC you MUST purchase this Tech inspection. USAC insurance is available here. All EMC drivers that wish to qualify may do so. This is not a requirement. The cost to qualify will be $250. This covers all the expenses involved with qualifying which include:, permit fees for racing, on site medical and live coverage. EMC will qualify on Monday, 2/5. As a reminder, 4500s and 4800s will start in the order they qualify regardless of class. Those that do not wish to qualify will be randomized amongst the 4500s and 4800s and will start behind qualified drivers from both classes. 4600s will start behind 45s and 48s in the order they qualified followed by randomized starts. If drivers are qualifying they must pay the $250 by December 31st, 2018. You cannot pay to qualify on site. We will be randomizing the names of those that did not pay to qualify and drawing them at the KOH Live Pre-Show in January. 4400s already pay for qualifying in their entry fees and do not need to pay for this option. All UTV/4900 that wish to qualify may do so. This is not a requirement. The cost to qualifies covers all the expenses involved with qualifying which include:, permit fees for racing, on site medical and live coverage. Those that qualify will start in the order of their qualifying time followed by randomized unqualified drivers behind them. If drivers are qualifying they must pay the $250 by December 31st, 2018. You cannot pay to qualify on site. We will be randomizing the names of those that did not pay to qualify and drawing them at the KOH Live Pre-Show in January. 4400s already pay for qualifying in their entry fees and do not need to pay for this option. Tents must be rented by 1/15. You are not required to rent a tent. This is a service offered drivers to protect their equipment from the elements. Please note: this is the only tent company with a BLM Permit to rent and erect tents in Hammertown. Please remember that all tents have guide wires that hang about 5' past a tent on each side, so a 20' tent takes up approx. 30'. Additional mandatory costs for this race include: Yellowbrick Trackers, USAC insurance, tech fees (only if purchasing single use USAC license, tech fee already included with annual license), and Pit Passes for teams. Additional optional costs include additional KOH Parking stickers and Camper Passes. T1 Desert Truck Registration includes tech fee. Additional items required for all drivers are USAC insurance. Yellowbrick gps tracker rental, Hammertown spot. Additional optional items are: Tent rentals, Generator rentals, Pit Crew passes, additional parking stickers for inside hammertown. Available at the Gate with Military ID - Do not purchase tickets online as all sales are non-refundable. Camper Pass - $20 online or at the gate. This fee applies to any camping vehicle with living quarters, (ie; RV, Trailer, Cab-Over, Toter-Home) entering Johnson Valley during KOH Week. This pass is good for the duration of KOH and is required of ALL attendees of KOH (spectators, pit crew, teams, etc) with a camping vehicle. Camping is primitive and first-come, first served for spectators outside of Hammertown. Registered teams will still be assigned addresses in Hammertown. This is a separate pass from the car/truck/pit bike parking passes required of teams that drive vehicles inside of Hammertown. We would like to make sure you have a safe enjoyable time while attending one of our racing events. Please take a moment to check out information on attending. From track-side safety to lodging, to campground information, it can all be found here. Per the Bureau of Land Management, no drones are allowed to be flown throughout KOH week as we have Helicopters for rescue and filming. Be sure to bring cash! Internet and Cell service are spotty. If you want to breeze through the front gate, the fastest way to do so is with cash. Hammertown, is the central meeting place during King of The Hammers week. It is located on Mean's Dry Lake in Johnson Valley, CA. The address for most GPS Units is: Boone Rd Landers, CA 92285. You can also type "King of the Hammers" into Google Maps and it will direct you there! Please review the Spectator Rules, especially if this will be your first time visiting and wheeling at King of The Hammers. First time at King of the Hammers? First-time visitors to the lake bed should take a look at this thread on visiting King of the Hammers. Here is another good resource for first time visitors. Not sure what to pack? Check here for some suggestions. Spectating: Hammertown promises to be bigger and better than ever in 2019. There will be two live jumbotrons, vendors open during the day and plenty of food vendors. There are also port-a-potties in Hammertown. Johnson Valley OHV area is open to everyone. The race course and within 150 feet of the race course is closed to the public on race days. The spectator areas are set up to give spectators a chance to see the race at a safe distance from the action. Many of these spectator areas are the same as in prior years where people have enjoyed watching the race. 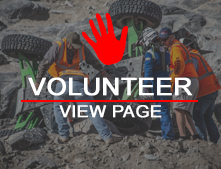 OHV Vehicles: All trail rigs, bikes, quads, UTVs, etc. need some form of permit. Street-legal vehicles need proper plates and registration. California OHVs need a green sticker. Out-of-state motorized vehicles will need to get an out-of-state green sticker. These will be for sale at the information booth in Hammertown. They can also be purchased in advance online by clicking here: Passes are good for the calendar year so you will want to wait until after January 1st to purchase. We will also have these stickers available at the front gate. PLEASE NOTE: ALL individuals in UTVs/Side by Sides are required to wear helmets per California law. Water and Dump Service: There will be a vendor on site in Hammertown where teams can go to schedule and pay for water and dump services throughout the week. Where does my spectator fee go? Camping: The cost to camp in Johnson Valley during KOH is $20 per Camping Vehicle (RV, Toter-home, Trailer, Cab-Over) It is dry camping, but there will be water trucks and dump trucks roaming the area that will service your vehicles for a fee. Most of Mean's Dry Lake Bed will be filled by Hammertown. 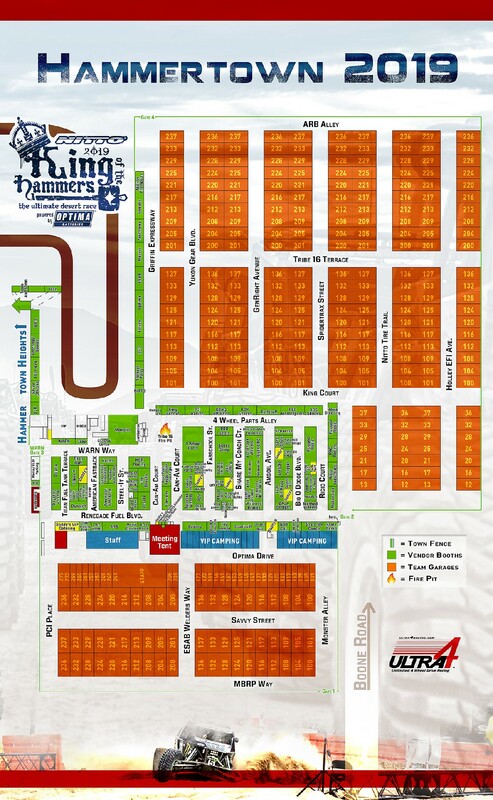 The race teams, vendors, and Hammer King HQ will all be on Mean's Dry Lake. Johnson Valley is an open OHV area, so other than Hammer Town, campers are able to camp essentially wherever they would like to as long as it's not within 150' of the race course. The two closest towns to The Hammers are Lucerne Valley and Yucca Valley. Yucca Valley has many major stores, including auto parts stores, Home Depot, Wal Mart, etc. Here is a link to stores in the Yucca Valley area. If you're looking for hotel accomodations we recommend the Best Western in Joshua Tree. Here is a list of items that can be found in Lucerne Valley.